Directed by Alfonso Cuarón with a remarkable bag of tricks at his disposable, Gravity is a big/little movie that is set entirely in space. With an extended opening shot that gives us a free-floating “lay of the land” in space, we slowly see that some approaching specs in the distance are actually Sandra Bullock and George Clooney, astronauts working on repairs as though it’s just another day at the office. This office just happens to be high above the earth, with a view that tops even the most exclusive of executive suites. Bullock plays Dr. Ryan Stone, a relatively noob to the outer space scened, while Clooney, as veteran space walker Matt Kowalksky, literally flies circles around her in a seamless tracking shot that shifts and glides from vantage point to vantage point with such fluidity, it begs the audience to wonder how the hell did they film this? After getting word from Mission Control in Houston that all will not go according to plan, however, the movie quickly becomes a tale of life, death, hope and desperation in the deepest, darkest reaches of space. Moving at a brisk 1 hour, 31 minutes, the story never really stops. 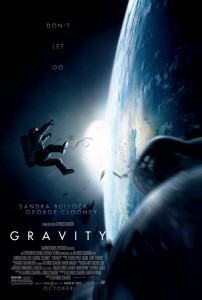 The acting is top-notch — Clooney charms but never smarms, Bullock bring a new balance of frailty and empowerment. In a way, however, Cuarón and his crew are the real stars of this movie, as you can never quite shake the bewilderment of how the film was made. Each shifting angle, each tilting POV, each glassy reflection is there to propel the film forward, never once suffering from CGI-overload. Simply put, Gravity is stellar.